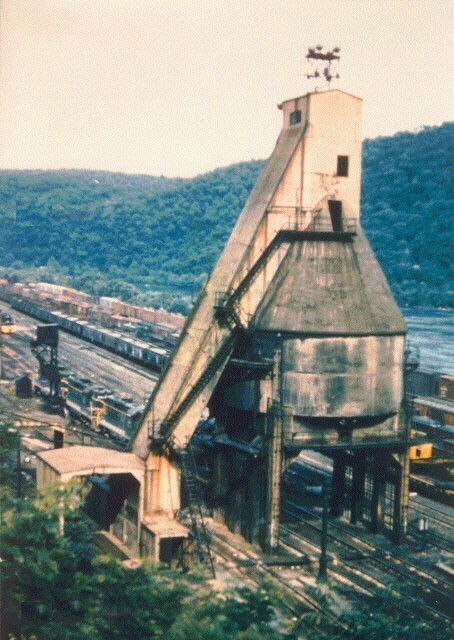 The Chesapeake & Ohio Railway yard and shops at Hinton, West Virginia, have been an interest of mine for over thirty years. My main theatre of interest is the West Yard, the engine terminal, at Hinton. I have over the years prepared drawings of the 800 Ton Fairbanks Morse coal dock, 200 Ton Fairbanks Morse sand bunker, the roundhouse, and numerous other structures for which the C & O Historical Society, Inc., has only partial or no plans. The drawings of the Hinton Coal Dock and nine of the trackside structures (shanties) were published in Model Railroader in a slightly different format in the early 1990’s. This site is intended to share my research over the last thirty odd years. A model railroader for thirty-five years and a Chesapeake & Ohio Railway modeler since 1973, I became interested in Hinton after doing some research to determine what real location on the C & O offered a steam era terminal, grades and tunnels which make putting more railroad in the limited space available for modeling "easier". I began researching Hinton after deciding that the location provided a ideal prototype for a steam era terminal from which to run C & O H-7 2-8-8-2's -- my favorite C & O steam. The run to the summit of the Alleghany Subdivision provides numerous tunnels including Big Bend Tunnel just east of Hinton where the legendary John Henry contested an early steam drill and steady grades which are ideal. The C & O track was laid through west end of Big Bend Tunnel September 12, 1872, and and the tracks reached to the east end of what became the Hinton's Avis Yard on September 25, 1872. The after discovered fact that Hinton was a division point between the New River Subdivision and the Alleghany Subdivision where all through freight and passenger power were changed validated my decision. I decided to start with the terminal and model in reduced form as much of the railroad to Alleghany, Virginia as time, space and money would permit with a single track main line and passing sidings to save space. I also had to determine what trains passed through or originated at Hinton so that I can approximate the prototypical mix, and re-create a steam locomotive terminal that was all but gone when I began my research about 1978. Originally, my interest was just to gather sufficient information to build models of the roundhouse and coal dock. Those two structures and some yard tracks were to be Hinton. It did not turn out that way. The research required on Hinton has become my hobby while I model some structures. My research and that of Jim EuDaly who has the track in his Hinton yards almost complete on his O scale layout determined that Hinton originated twelve eastbound coal drags each day powered by two H-7's in the early 1940's and two H-8 Allegheny 2-6-6-6's in the late 1940's -- one on the head end and a pusher. An equal number of westbound empties arrived. Manifests used H-7's or H-8's and passenger trains used 4-8-4's, 4-8-2's and occasionally an H-8 on the Alleghany Subdivision, and 2-8-4's, 4-6-4's and 4-6-2's respectively on the New River Subdivision. Double heading passenger trains was common over the hill. Four 0-8-0 or 0-10-0 switchers worked each trick at the Hinton yards, and 2-8-0's, 2-8-2's and 2-6-6-2's were used on local freights on the New and Alleghany Subdivisions. Although no mine shifters worked out of Hinton, 2-6-6-2's were used to haul coal on the Greenbriar Sub to its interchange with the Western Maryland at Durbin, and handled coal off the Meadow River from Rainelle. As a result of all the activity, 70 to 100 steam locomotives were serviced in the "pit" as the locomotive service area at Hinton was known every 24 hours. This would keep anyone's Friday night model railroading group busy. In addition to changing locomotives and originating local passenger, local freights and coal drags, one also have to live with the constraints of using steam power. For every hour spent on the road, a steam locomotive typically needed an hour or more of maintenance or servicing. If you run steam or plan to all the service, maintenance and time must be taken into account when running the railroad. There was no such thing as a quick turn-a-round for steam. The maintenance of a railroad's steam locomotive fleet was an industry in and of itself and that is what I hope to recreate. When first generation diesels came to Hinton they required an inspection every 24 hours, and if they could make a run before their clock ran they were sent back on the road without inspection. It is very easy to see why diesels replaced steam in a three-to-one or sometimes four-to-one ratio, but it took until recently for single diesels to approach the more than 6000 horsepower that a single H-8 provided. I also had wanted to recreate the setting and structures at Hinton to produce an overwhelming impression of Hinton. Whatever compromises I made, the Hinton coal dock, roundhouse and accompanying structures will clearly evoke Hinton and the C & O to anyone who saw my railroad. Of course, modeling real structures at a real location has its problems. The first and foremost is the lack of drawings and photographs -- deep in the New River Gorge, Hinton was very much off the beaten track. With permission after tendering signed releases on each occasion, I partly resolved the problem by climbing onto the remaining structures with camera and tape in hand and doing the drawings myself with the indispensable aid of a computer aided drafting (CAD) program. As a result of the time required for the research, the drawings, several moves over the last twenty odd years, and three children now ages nineteen to twenty-six, track laying which I originally started in 1984 has been delayed probably forever as the research has subsumed the modeling. Jim EuDaly has finished his modeling of Hinton, but I do have the coal dock and sand bunker. I will also have the satisfaction of knowing that I have done some original research and that Jim EuDaly and anyone else who attempts to recreate Hinton and the Chesapeake & Ohio Railway in the steam era will rely on my research and work -- and it all started with a simple desire to build a model of the Hinton coal dock and roundhouse for my model railroad. I wish to thank Thomas W. Dixon, Jr., The Chesapeake & Ohio Historical Society, Inc., W. S. "Sims" Wicker, former yard master at Hinton and especially former pit foreman Charles Hannah who was kind enough or exasperated enough with all my questions to tell me that I knew more about Hinton than he did after working there from 1938 to 1955. Please feel free to email me using the email address on the Contact page. If you have any material relevant Hinton that you would like added to this website I would be more than happy to add it subject to my decision on its appropriateness and the rules of the COHS concerning this website and the material posted hereon. Although the mountains are the Allegheny, the C & O subdivision is the Alleghany Subdivision with the summit at Alleghany, Virginia, and the eastern terminus Clifton Forge, Virginia.